Maybe you’re a Death in Paradise fanatic with a boat (or cat) named Roast Beef, or maybe you’re just looking for something new to watch. Although it’s hard to find a show that balances humor and seriousness as well as Death in Paradise does, we wanted to compile a list of similar shows to fill the void while we wait for season eight (due out next year). First, we want to mention two enchanting shows about displaced Brits in tropical environments. It’s a lot to get accustomed to if you’re used to putting on a scarf before leaving the house… and suddenly you’ve found yourself in a tropical paradise that tests the limits of your deodorant. The Good Karma Hospital – Dr. Ruby Walker and her boyfriend have separated and it’s time for something new. Instead of filling her void with a new man, she runs away to India; life is a little different here (okay, a lot) and Dr. Walker feels a little out of her depth. The production is everything you’d expect out of a production about India—vibrant, colorful, and full of beautiful scenery. (The show was actually filmed in Sri Lanka). 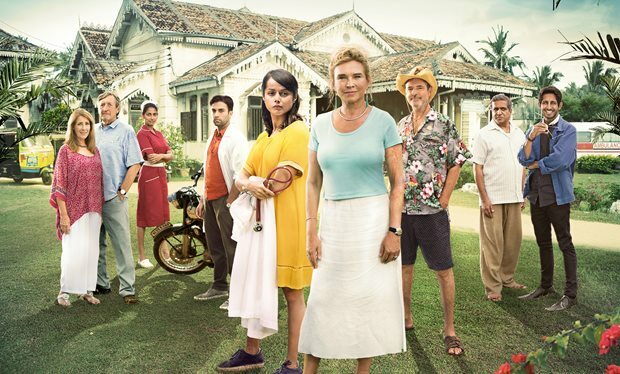 Like Death in Paradise, The Good Karma Hospital balances seriousness and humor well and the atmosphere draws you in. You can find it on DVD or streaming on Acorn. The Durrells in Corfu – This show, rather than a detective or doctor, features a family. The Durrells are strapped for cash and Corfu is cheaper than the life they were used to back in England. 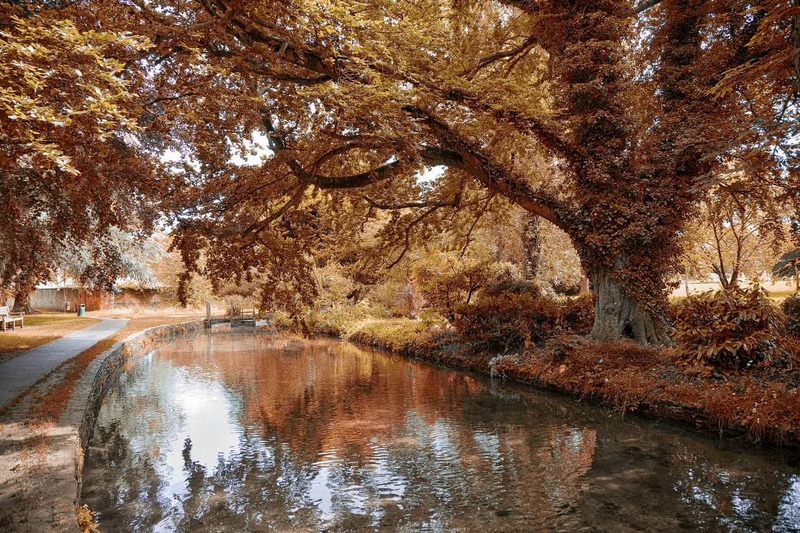 While we watch the Durrells get used to their new environment with their plucky charm, we also get to see stunning landscapes of Corfu, an island just off the coast between Albania and Greece. Louisa Durrell, played by Keely Hawes, has three sons and a daughter. Her oldest son is a writer, the second is in search of a passion, her daughter is boy-crazy, and her youngest son is obsessed with the animals of Corfu. It’s a warm, heartening tale of resilience and family ties. You can find it on DVD or streaming on Amazon or PBS Passport. Now, let’s talk about some good old-fashioned mysteries. Everyone knows the second-best part of Death in Paradise (after that jaw-dropping scenery, of course) is the mystery. Death in Paradise is a typical whodunnit where the suspects gather together and the detective explains the mystery. With that in mind, here are some serialized mysteries you can’t miss if you love Death in Paradise. 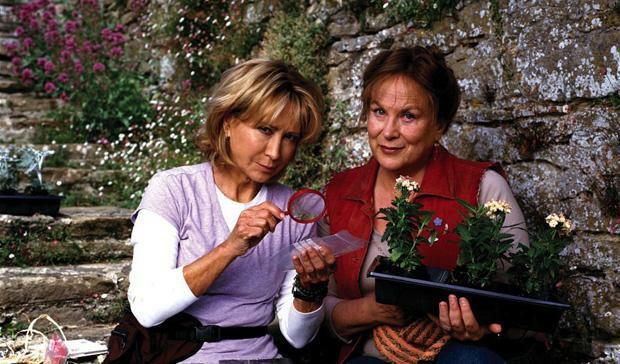 Midsomer Murders – We couldn’t make this list without mentioning Midsomer Murders, could we? This show spans two detectives, six detective sergeants, and countless murders (at least, it’s over 200 dead). The people of quaint Midsomer may be violent, but it’s a joy to watch the English countryside roll by and try to guess who the baddie is. If you’ve seen Death in Paradise, chances are, you’ve probably seen Midsomer Murders; but with twenty seasons, it’s easy to forget the plots and re-watch. 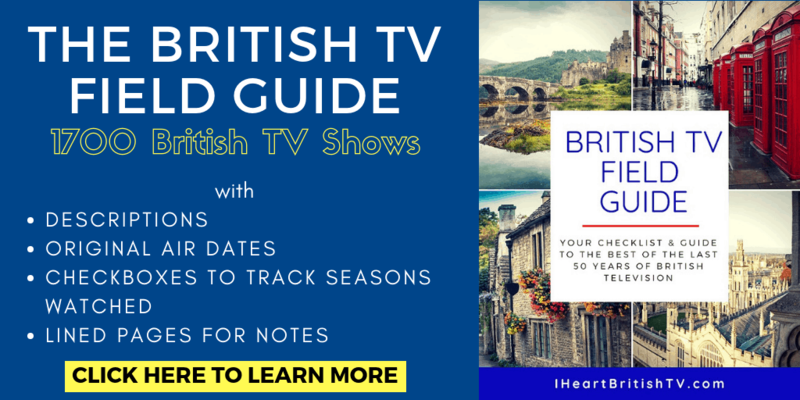 It has the quirky, interesting characters we’re used to from Death in Paradise, but it’s set in the English countryside, so it’s perfect to watch with a cup of tea (rather than a piña colada, obviously). You can find it streaming on Netflix, BritBox, and Acorn. Father Brown – This little show is about a Catholic Priest with a knack for solving mysteries. It stars Mark Williams (whom you may recognize as Arthur Weasley if you’re are Harry Potter fan) as Father Brown. The characters are quirky and often a little exaggerated for humor. The scenery is quaint and quintessentially English. There is a nice balance of humor and serious crime. “You’re far too tactile, Father. Has anyone ever told you that?” Father Brown knows how to thwart a baddie. I won’t say he’s in the wrong profession, but at least he finds an outlet for his ability to solve crimes. You can find it streaming on Netflix or on DVD. Rosemary & Thyme – the perfect pair. No, they’re not sprinkled over a roast chicken, Rosemary & Thyme are two ladies who garden by day and solve mysteries by night. This show is a cozy romp among gardens and lush landscapes with a baddie lurking around every rosebush. You can find this charming mystery on BritBox. Agatha Christie’s Marple – Miss Marple is an elderly spinster who always finds herself solving another crime. Think Nancy Drew, but much, much older. They base this show on Agatha Christie’s novels and short stories, so you know it must be good. There are a lot of artistic liberties compared to Christie’s source material, but that doesn’t hurt the show. Also, you'll see a lot of familiar faces as guest stars. There were also a series of adaptions back in the 80s. We’d recommend all of them if you can find them. For now, Marple is streaming on Acorn and Hulu. Three seasons of an older adaptation (1984) are on BritBox. Hetty Wainthrop Investigates – Does everyone moonlight as a detective in England? Fans of Keeping Up Appearances will be interested in this mystery series. Apparently for Hetty, being a housewife just wasn’t enough. Now, she’s a hobbyist sleuth. This quirky detective series is streaming on BritBox. Finally, we want to mention a few shows starring our favorite detectives: Ben Miller, Kris Marshall, and Ardal O’Hanlon. (Also, be sure to let us know who is your favorite Death in Paradise detective in the comments below. We want to hear why, too. We can’t pick a favorite because we love them all for different reasons! But they clearly meant Ben Miller to be the quintessentially British detective trying to handle a job transfer he didn’t really want.). Ben Miller was halfway through his PhD in Physics at Cambridge when he switched to comedy. Now, he has a long history in British comedy and many other genres. He even showed up as Sheriff Nottingham in an episode of Doctor Who. You can find him on Primeval, What We Did on Our Holiday, and even an episode of Marple. Kris Marshall also has a long career, including many comedic roles. He was in Death at a Funeral, Love Actually, and Murder City. Ardal O’Hanlon is an Irish actor and writer. He was in Father Ted, London Irish, and Handsome Devil. You can also see him in an episode of Doctor Who. Any Other Shows Like Death in Paradise? So, what do you think? 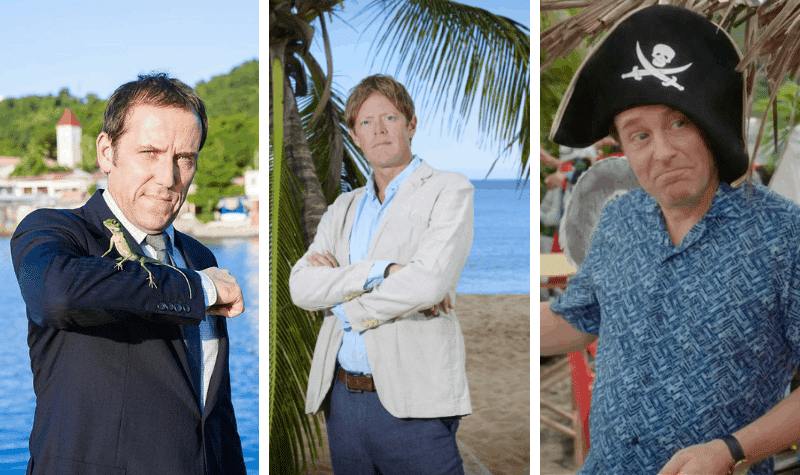 Are there any other shows like Death in Paradise we should have mentioned? Love Ben Miller. The others are great also, but Miller was the best. ❤️ He is great in everything he is in. i love death in paradise, never miss an episode i record all of them including midsommers murders, father brown, doc martin, miss fisher mysteries. death in paradise i love the new ardal o’hanlon he has his own unquie way of solving a murder. he’s great i love him. kris marshall was ok he had a funny way of solving his murders. ben miller did not care for. i hope ardal stays with us and i hope he and franc some how get together. sorry to hear about dwayne i don’t think you’ll find another like him. to bad he’s leaving. love midsommers murders great show.father brown love even more. i wish they bring back sid. keep makeing the shows we love them. waiting for some new ones death in paradise, midsommers murders, father brown. what ever happen to shetland and the coronor.